With spring here and the winter cold and flu season over, you may think you're out of the woods when it comes to contracting some nasty illness. Think again. You never know when some evil cooties are lurking on the next door knob or when someone is going to sneeze on you in a confined area. Ranking a close second behind my self-proclaimed Calf Injury of 2011 is now my Upper Respiratory Infection/Pneumonia/Bronchitis Crud of 2012. After a month of getting back on the workout wagon, I was knocked off again for more than three weeks...And I felt like the wagon ran right over me in the process. 2. Respect what the illness has done to your body: The general rule of thumb is that if your illness is from the neck up (like a cold), it's o.k. to continue working out if you're feeling up to it. If your illness is from the neck down (like pneumonia or diarrhea), then you shouldn't work out until you're healthy. Importantly, as long as you have a fever, you shouldn't be working out at all. If you have a cold, your recovery period isn't going to be as long as if you have pneumonia, bronchitis, or an upper respiratory infection. Even when you don't feel sick anymore, your body is still fighting off your illness. Respect the illness that you had and how hard your body fought to get better, and allow an appropriate amount of time of being totally asymptomatic before you start pushing it to workout again. If you push too hard or too soon before your virus or bacteria is completely gone from your body, the stress of working out (which comprises your immune system as it is) can further compromise your immune system enough to make your illness come back. My doctor recommended that I wait until I'd been totally asymptomatic (no fever, coughing, etc.) for an entire week before I started working out again. 3. Remember this word: SLOW: My doctor also said that once I was able to work out again, I needed to start out slow - specifically, by walking. For endurance athletes, the concept of walking for a workout seems as exciting as flying a kite. But, starting with baby steps is tremendously valuable for two reasons. First, if you're exhausted or winded from walking, then that's the best indicator that you're not up for anything more demanding. Second, if you've been out of the game for more than 7-10 days, your endurance will begin to decline. When that happens, you can't just pick up where you left off. You have to start slow and short...Re-build your base. If you've been off for less than 7 days, you're endurance isn't going to suffer and you should just pick up your training schedule where you left off. Do not try to make up the miles you missed. If you've been off for 1-2 weeks, start back at about half the mileage you were up to before your illness and increase slowly. You should be back up to your prior mileage in 2-4 weeks. If you've been off for more than 2 weeks, you'll want to be particularly careful. You may want to start with some cross-training and, more importantly, start with walk/runs. Then you can gradually reduce your walking time and increase your running time. Realistically, it's going to be more than a month before you're back up to your pre-illness mileage. 4. Rebuild your digestive tract after taking antibiotics: Your digestive tract is important to your immune system because your digestive tract is one of the primary mechanisms through which your are exposed to pathogenic organisms. Your digestive tract doesn't just digest your food - it protects you against bacteria and infections. Nearly 3/4 of your immune system lies in your digestive tract. Your digestive tract also contains hundreds of different species of "good" bacteria, which Harvard scientists believe can influence the development of certain aspects of the immune system. When you take an antibiotic, it destroys not only the "bad" bacteria that caused your illness, but also many of the "good" bacteria in your digestive tract. To re-build the good bacteria in your digestive tract, you may want to take a probiotic after your course of antibiotics. WebMD provides some tips for selecting the right probiotic for you. 5. Consider acupuncture to help get you back on the road: I'm a big believer in acupuncture. Without going into why it works, let me just say that my acupuncturist - a.k.a. Mr. Miaggi - has done wonders for me. He's fixed injuries that plagued me for years, helped break up scar tissue caused by the Calf Injury of 2011, and, now, helped my lungs/muscles recover from the Upper Respiratory Infection/Pneumonia/Bronchitis Crud of 2012. Once I started feeling better, I had lingering pain in my lungs/ribs and couldn't get a deep, normal breath. So I went to see Mr. Miaggi and he explained that all the weeks of coughing had left my chest muscles in knotted up, tight, and very weak. When those muscles are tight, they can't expand as well to get a deep breath. After the first session with him, my chest and breath were significantly improved. After the second session, the pain/tightness was completely gone and my breathing was back at nearly 100%. Whatever your illness or injury, I recommend acupuncture to help your body recover. I hope you're all staying healthy and fit this spring! What tips do you have for rebounding after an illness? 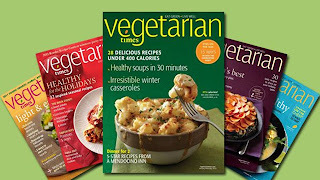 I just received a notification from Vegan Coupons on Facebook for 1/2 off the subscription price of the Vegetarian Times. If you haven't checked out Vegan Coupons, I really urge you to do it because they let you know about great deals on all kinds of vegan goodies. 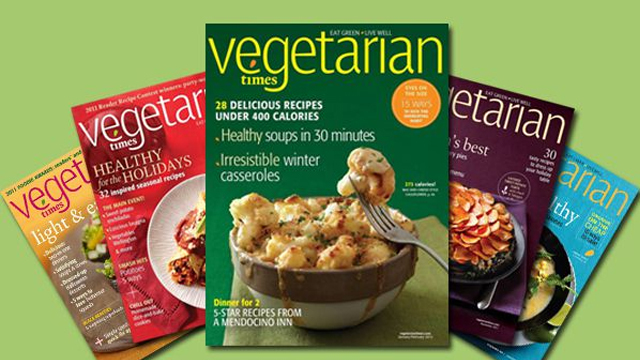 And if you haven't checked out the Vegetarian Times, well here's your chance. I'm offering a gift subscription! All you have to do is answer the questions below by 6:00 p.m. EDT on Tuesday April 24, 2012, and then that evening, I will draw the name of the lucky winner. Now, before you get too excited, I have to confess...the gift subscription is only $6.00. But hey, never look a veg gift in the mouth, right? So if you've been thinking of transitioning to a veg lifestyle and want more recipe, party planning, and gardening ideas, then here's a great starting point. In addition, in the next week or so, I'll be posting some tips for transitioning to a veg lifestyle. (a) Are you currently or have you ever been a vegetarian or vegan? (b) If you are not currently a vegetarian or vegan, is your goal to transition to a veg lifestyle, or just try to incorporate more veg meals into your diet? (c) What is your primary reason for wanting to either transition to a veg lifestyle or try to incorporate more veg meals into your diet? 2. Provide your name and email address in your response. If you'd rather not provide your email address in your comment, you can send it to me at MWally40@gmail.com. 3. Provide your response by 6:00 p.m. EDT on Tuesday April 24, 2012. 4. After the close of the deadline, if there is more than one entry, I will draw the name of the lucky winner and notify that winner by email. The email will request that you provide me your mailing address where the gift subscription can be sent. You must provide me with your mailing address within 24 hours so that I can purchase the gift subscription before it expires. Green Your Shoes: You don't literally have to wear green shoes, but you can certainly select more environmentally friendly ones. The midsoles of most running shoes contain Ethylene Vinyl Acetate, which is one of the most non-biodegradable aspects of running shoes and can last up to 1,000 years in a landfill. Brooks has developed a midsole technology they call BioMoGo, that degrades 50% faster than standard midsoles. 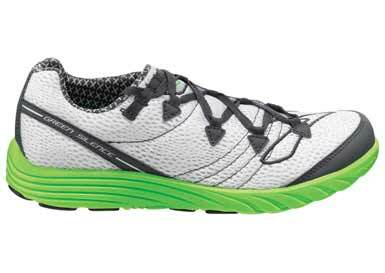 The company has used this technology in their Green Silence racing shoe, which also contains 75% post-consumer recycled materials, 100% post-consumer recycled laces, biodegradable insole, and water-based adhesives (but no, the shoe won't fall apart in the rain). New Balance also sells a green shoe called the New Balance 70 - a trail running shoe with a reduced waste design, an upper with natural and recycled components, a rice husk rubber outsole, and water-based adhesives. Green Your Clothes: There are numerous companies now using recycled and/or organic materials for athletic clothing. Atayne has 100% recycled performance running, biking, and hiking apparel. Technical All Season Comfort by thriv np, Inc. uses a revolutionary Bamboo Performance Technology for its sports tops and bottoms that's lightweight, moisture wicking, breathable, anti-odor, and SPF-50. Gaiam has yoga and fitness clothing made from eco-friendly materials such as rayon from sustainable bamboo, 100% organic cotton, and ActiveSoy (an organic cotton/soy blend). 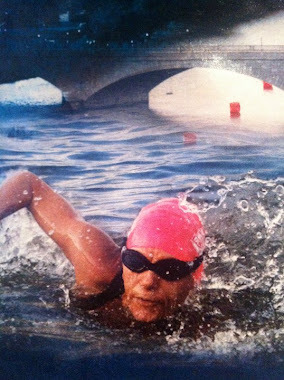 For swimmers and triathletes, the DeSoto company employs a GreenGoma limestone rubber technology to replace the petroleum in its wetsuits. Drip Dry Your Clothes: About 70% of the carbon footprint from apparel comes from washing and drying, most of which comes from the clothes dryer. Hang your athletic gear up to dry instead of using the clothes dryer. It's not only gentler on the planet, but also on the clothing. Bring A Reusable Bottle: Whether it's your workout or a race, bring your own reusable water bottle. Avoid using bottled water, which creates significant pollution. According to National Geographic's Green Living, Americans drink 29 billion bottles of water every year - more than any other nation. Only about 13% of those end up being recycled. In 2005, approximately 2 million tons of water bottles ended up in landfills, which take centuries to decompose. In addition, the production of plastic water bottles requires millions of barrels of oil every year and the transportation of bottled water releases thousands of tons of carbon dioxide. On top of that, think of all the hundreds of thousands of paper cups that are used at athletic events. So take your own water bottle or sports belt and fill it up at the water stops. Make sure the bottle is BPA- and phthalate-free (note that many Nalgene bottles contain BPA). Lose the Packaging: Instead of using sports drinks in plastic water bottles or gels and bars in wrappers, used powdered sports drinks and take local, organic foods like fruits or make your own energy bars. Choose a Safer Sunscreen: Your skin is your body's largest organ, which makes it a significant conveyor of toxics to your body. According to MindBodyGreen, your skim absorbs 60% of any topical product you use. 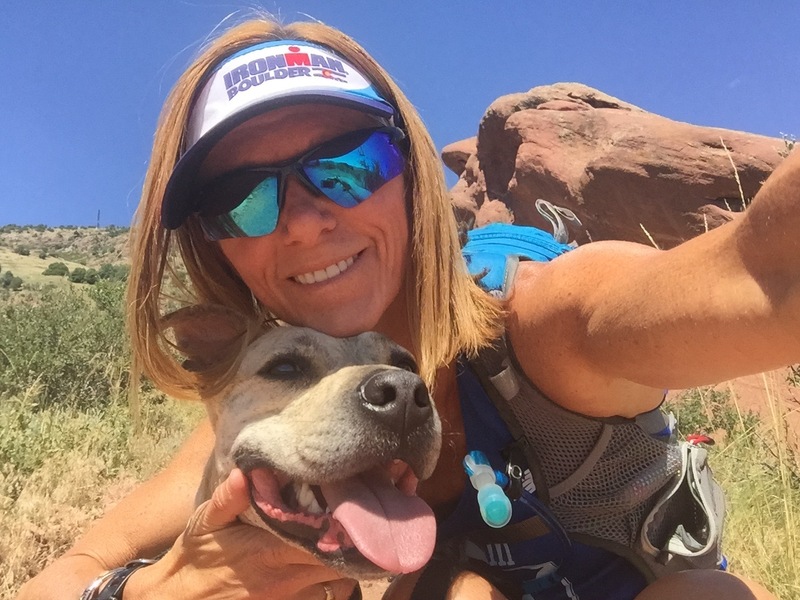 The FDA has no standards for sunscreens, so you need to be careful in choosing a sunscreen to protect you during training and races. The Environmental Working Group has released its extensive sunscreen guide reviewing 292 brands and over 1,700 products. EWG recommends brands that contain zinc and titanium rather than potentially hormone-disrupting chemicals like oxybenzone, or Vitamin A (which can be carcinogenic on sun-exposed skin). Repurpose and Reuse Gear: Athletic gear is expensive, so help yourself and others by repurposing your gear and reusing other people's gear. Instead of throwing out your running shoes, donate them to an organization like Soles4Souls, which collects new shoes to give to the victims of catastrophic events and collects used shoes to support micro-business efforts to eradicate poverty. Runners World also has collected a list of charities where you can donate your used running shoes. You also can recycle your used running shoes into materials used for sports surfaces like basketball courts. Recycled Runners.com offers a nationwide directory of locations to drop off your old running shoes for recycling. Also, don't forget to look for gently used equipment, like bikes or treadmills, for yourself instead of spending lots of money on brand new equipment. Find Green Races: A Fit Planet has an entire calendar of green races that have taken the Pledge of Sustainability and committed to various eco-friendly practices such as reducing paper waste, providing recycling bins, and providing t-shirts made only of organic cotton. You can search by event type (triathlon, running, swimming, biking, even hockey) and distance. You may be surprised at some of the green events - like the 2012 New York City Triathlon and the 2012 Marine Corps Marathon. Travel Together: This is a simple, but effective one: carpool to events and workouts. Purchase Carbon Offsets: Whether you're traveling by plane or car, you can offset your carbon emissions. Websites like Terrapass provide a calculator for computing your carbon footprint. For example, for my 2010 Subaru Outback, I produce approximately 8,444 pounds of carbon dioxide if I drive 10,000 miles a year. For only $53.55, I can purchase offsets for 9,000 pounds of carbon dioxide. Many green events (like those by A Fit Planet) may also offer carbon offsets for that particular event. Adopt a Trail: Next time you're running or biking along your favorite trail or road, take a look at how much garbage you see along the way. Then get some of your friends together and either officially or unofficially adopt the trail by having a trash pick-up day. Unplug Your Technology: Finally, all those Garmins, Computrainers, and iPods that you leave plugged in to charge them up - unplug them once they're charged. In addition to saving electricity, you'll also save your device's battery life, which can start to decrease with too much charging. So unless your device won't get you through your next workout or race, let it drain down before re-charging it. Happy green training and racing, everyone! Do you have any other green tips for athletes? This is a long overdue finale in this 4-part series that I started back in February. Ironically, however, this Earth Day weekend is the opportune time to talk about the final reason why I decided to become a vegan: to help out our fragile Mother Earth. By now hopefully you've read the first three parts: Part 1 (to reduce animal cruelty); Part 2 (improved health and physical performance); and Part 3 (faith-based reasons, with the guest blog post from my friend Lois Godfrey Wye). Each of these four reasons, to me, is equally important; but, for each of you, one or more of these reasons may hold more weight. My hope is that at least one of theses reasons has made you, or will make you, examine your food choices more carefully. Assuming you undertake that examination, the next step is to help you make the transition to a vegetarian/vegan lifestyle...But I'll save that for a later blog post. I think that out of all four reasons, this last reason may be the most controversial. So let me state at the outset: I do not believe that every human being must become a vegetarian or vegan to save the planet. I also do not believe that eliminating all worldwide meat, poultry, fish, and dairy production is necessary to save the environment. Finally, I recognize that there are numerous studies on both sides of the fence, some arguing that moderate meat consumption is necessary to deal with agricultural surplus, and some arguing that the massive agricultural industry is the biggest, if not one of the biggest, threats to our environment. I'm not a scientist and I'm not about to insert myself into the middle of those debates or try to nitpick the facts/analyses of these various studies. Rather, for me, the environmental aspect of my decision to become a vegan is a way for me to avoid being a part of the massive, exploitative factory-farming and overfishing industries that, without a doubt and regardless of which study you read, wreak havoc on our precious environmental resources. This environmental aspect is the icing on the cake for me - it's not necessarily the foundation of my vegan lifestyle. A January 2008 New York Times article reported that in 1961, the world's total meat supply was 71 million tons. In 2007 it was 284 million tons. By 2050, world meat consumption is expected to double. That same article noted that two geophysicists estimated that if all Americans reduced their meat consumption by just 20%, it'd be the equivalent of switching from a standard sedan like a Camry, to a Prius. Also, a 2007 study by the National Institute of Livestock and Grassland Science in Japan estimated that production of 2.2 pounds of beef is equal to the amount of carbon dioxide emitted by the average European car every 155 miles, and burns enough energy to light a 100-watt lightbulb for almost 20 days. More than 1.7 billion animals are used in livestock production worldwide and occupy more than 1/4 of the Earth's land. Production of food for livestock animals consumes about 1/3 of the total arable land. The livestock sector, including transportation and feed production, accounts for approximately 18% of all greenhouse gas emissions worldwide, including 9% of carbon dioxide and 37% of methane emissions worldwide. Much of the world's pastureland has been degraded by grazing or feed production. Many of the world's forests have been cleared to make way for additional farming. Feed production requires the intensive use of water, fertilizer, pesticides, and fossil fuels. (The Stanford Woods Institute for the Environment also discusses the March 2010 Report and summarizes some of its findings). In 1998, the United States Environmental Protection Agency's National Water Quality Inventory indicated that agricultural operations are a significant source of water pollution in the United States. Agricultural operations are estimated to contribute, at least in part, to the impairment of 170,750 river miles, 2,417, 801 lake acres, and 1,827 estuary square miles. Manure runoff contains substances like ammonia, nitrogen, phosphorous, and pathogens, as well as antibiotics, pesticides and hormones from food and drugs given to the livestock. These pollutants impact surface water, groundwater, soil, and air. In surface waters, ammonia and increased oxygen demand from manure runoff can cause fish kills and reduced biodiversity. Solids from manure can increase turbidity and smother organisms. Nitrogen and phosphorous can result in eutrophication and algae blooms. In groundwater, pathogens and nitrates from manure can impact drinking water. In fact, according to EPA, nearly 2% of the American population is exposed to increased nitrate levels in water from drinking wells. Moreover, "animal feeding operations" ("AFO's") present additional issues. According to EPA, AFO's are "agricultural enterprises where animals are kept and raised in confined situations. AFO's congregate animals, feed, manure and urine, dead animals, and production operations on small land area. Feed is brought to the animals rather than the animals grazing or otherwise seeking feed in pastures, fields, or on rangeland. There are approximately 450,000 AFOs in the United States." Air emissions and odors from AFO's pose a significant problem. Odor emissions at AFO's come from manure storage facilities, animal housing, and land application of manure. Animal waste decomposition releases volatile organic compounds, in addition to other gases such as ammonia, methane, and carbon dioxide, which have implications for global warming and acid rain. In fact, EPA estimates that 1/3 of the methane produced each year comes from agriculture (primarily animals and manure storage units). Overfishing can reduce the spawning of a fishery below desired levels. Overfishing can cause the reduction of large, long-lived, high-value predator species, and the increase of small, short-lived, and lower-value prey species - a process called "fishing down the food chain." Non-selective fishing gear can result in the entanglement of fish, turtles, and seabirds, resulting in the unintended catch (a.k.a. "bycatch") of juvenile fish and vulnerable or endangered species. These bycatch usually are discarded dead. The use of trawls and the use of other mobile gear such as dredges on the bottom of the ocean can change the bottom structure, benthic structure, and microhabitats. These impacts are particularly troublesome in areas where there are coral reefs, sponges, tube worms, sea grass, and algae beds. As I stated at the beginning, there are some benefits to animal agriculture. As EPA notes, animal manure is a valuable soil fertilizer and conditioner, when used in the proper conditions. Also, for some areas of land, raising livestock is the only viable option for land usage, e.g., where the land cannot be used to grow crops. So I appreciate that, from the environmental standpoint, elimination of all animal agriculture is not the answer (and probably the same goes for the elimination of all fishing). Recognizing this fact, the FAO reports cited above provide suggestions for more sustainable agriculture and fishing. But what does that mean for someone like me? Why not support more sustainable agriculture and fishing? Well, read the first three Parts of this series....Personally, I'd rather drive the Prius than the Camry...And I'd rather save another living creature than assume that it's only value is to put food in my belly. Are you more likely to (a) try a completely veg lifestyle; (b) reduce your consumption of animal products; or (c) not make any changes to the amount of animal products you consume? If you were to try a veg lifestyle or try to reduce your consumption of animal products, what would be your biggest reason(s) for doing so? Hey everyone...I hope that you had a good Easter and Passover. Just an update on my MIA status. After very little improvement last week and a persistent fever, I went back to the doctor on Saturday and they said that I actually have pneumonia. Ugh - how old am I?? Anyway, they gave me some meds that I just finished today and I've been improving a little bit each day. Unfortunately I had to go to work on Tuesday to file the brief that I blame for making me sick, and I think that all the activity kinda took its toll because today I'm pretty weak and tired. So I've just been hanging out on the couch today, sleeping a lot. But I'm hoping that tomorrow I'll see a big improvement! Fingers crossed! If you've been sick or injured for a significant period of time, you know how stir-crazy you can get, especially if you're used to a pretty active lifestyle. I've watched all the movies and On-Demand t.v. series that I care to watch. Fortunately though, I've actually been able to watch some Cubs games, which I really missed last year. (Unfortunately not much as changed because they still stink). My house is a disaster. There are about six loads of laundry to fold. And as much as I love the vegetable soup that I make, I'm sick of eating it every day and need to find something else to make. On top of that, the really bad news is that apparently this takes awhile to recover from, so I don't even think I'll be able to start my workouts back at square 1. I may have to start at square 0...according the doctor I'm supposed to start back to physical activity by walking. Huh? What's that? She said that my body right now is fighting so hard for oxygen, that I don't want to do anything that demands a considerable amount of oxygen or that dehydrates me. So the good lord is gonna need to place a heavy hand on me to hold me back because at this point I'm so sick of feeling like an unhealthy weakling that all I want to do is bust out for a run or bike ride. Given that going up my stairs is a chore, however, that's probably not wise. So I'll need to totally re-vamp my well-thought-out periodized workout plan that'd I'd engineered a couple weeks ago. 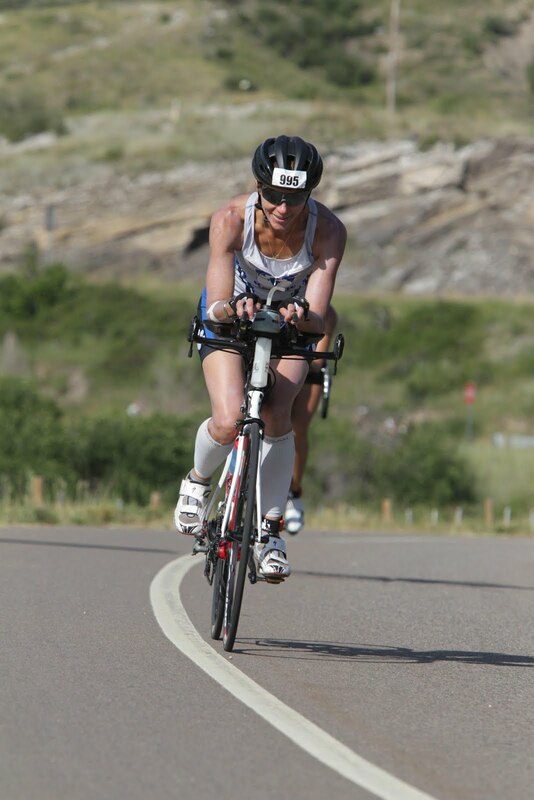 I have an Olympic triathlon on July 7th, which is plenty of time. Unfortunately I was considering signing up for one on June 2nd too, so I may need to re-think that one. Anyway, enough whining. Although I haven't been writing, I've been thinking of blog ideas. Among them so far are: (1) how to transition to a vegan lifestyle (a topic that several friends have requested that I write about), (2) my journey to a minimalism (in running and life), and (3) how to revamp your workout after an injury or illness (wonder what prompted that idea?). I command of each of you to swim, run, or bike a little extra distance for me over the next couple weeks! Maybe I can absorb fitness through online osmosis. What's been the worst injury or illness that you've had to rebound from and how'd you do it? How have your workouts been going the past couple weeks? Any blog ideas you'd like me think about? Howdy strangers! 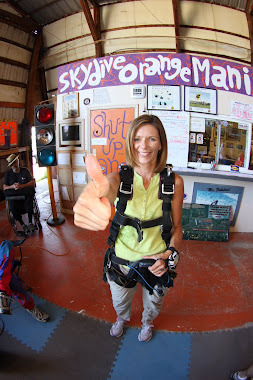 Just a quick post to let you know that I may have fallen off the edge of the Earth, but I am alive...barely! After a couple weeks of trying to get a brief done for work, including one week of being up 'til the wee hours of the morning every day, I succumbed to a wicked viral infection. Last Thursday nite as I was up working on my brief, I started feeling a fever coming on, and by 5 a.m. I had a 101.5 temp. That has persisted now for SEVEN days!! I went to the doctor on Monday who, after ruling out the flu and strep, diagnosed me with some vague "upper respiratory infection," which is viral and has to run its course. He said that normally takes 5-7 days. Well, it's day 7, and I've yet to feel much better. My fever is down to about 100, but even that spiked again this afternoon, and my headache and cough are gettin' real old! After 7 days of fevers ranging from 100-102.5, headaches, and coughing up all kinds of gunk, I've had it!! I'm about ready to search out an exorcist to get this evil out of my body! Hope you're all continuing to work out and enjoy your spring!! Happy Passover and Easter!